"The Entombment" redirects here. 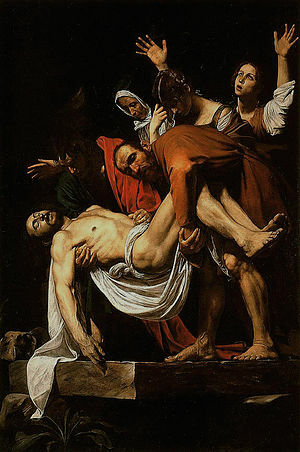 For other uses, see The Entombment (disambiguation). The earliest reference to the burial of Jesus is in a letter of Paul. Writing to the Corinthians around the year 54 AD, he refers to the account he had received of the death and resurrection of Jesus ("and that he was buried, and that he was raised on the third day according to the Scriptures"). The four canonical gospels, written between 66 and 95AD, all conclude with an extended narrative of Jesus' arrest, trial, crucifixion, burial, and resurrection. :p.91 All four state that, on the evening of the Crucifixion, Joseph of Arimathea asked Pilate for the body, and, after Pilate granted his request, he wrapped it in a linen cloth and laid it in a tomb. There are significant differences between the four accounts, recording the evolution of the tradition from the earliest gospel (that of Mark) to the last (the Gospel of John). Modern scholarship tends to see the gospel accounts as contradictory, and finds the Mark portrayal more probable. 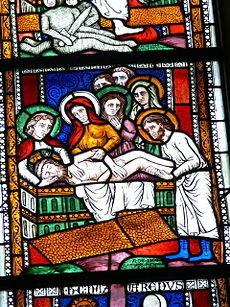 In the earliest of the gospels, the Gospel of Mark, written around 70AD, Joseph of Arimathea is a member of the Jewish Council – the Sanhedrin which had condemned Jesus – who wishes to ensure that the corpse is buried in accordance with Jewish law, according to which dead bodies could not be left exposed overnight. He puts the body in a new shroud and lays it in a tomb carved into the rock. The Jewish historian Josephus, writing later in the century, described how the Jews regarded this law as so important that even the bodies of crucified criminals would be taken down and buried before sunset. In this account, Joseph does only the bare minimum needed for observance of the law, wrapping the body in a cloth, with no mention of washing or anointing it. This may explain why Mark has a story prior to the Crucifixion, in which a woman pours perfume over Jesus (Mark 14:3-9): Jesus is thereby prepared for burial even before his death. "And they made his grave with the wicked, And with the rich his tomb; Although he had done no violence, Neither was any deceit in his mouth." This version suggests a more honourable burial: Joseph wraps the body in a clean shroud and places it in his own tomb, and the word used is soma (body) rather than ptoma (corpse). The author adds that the Roman authorities "made the tomb secure by putting a seal on the stone and posting the guard." This detail may have been added to answer claims by contemporary opponents that the followers of Jesus had stolen his body. The Gospel of Mark is also a source for the account given in the Gospel of Luke, written around the year 90. As in the Markan version, Joseph is described as a member of the Sanhedrin, but as not having agreed with the Sanhedrin's decision regarding Jesus; he is said to have been "waiting for the kingdom of God" rather than a disciple of Jesus. The last of the gospels, John, differs from Mark on this point, depicting Joseph as a disciple who gives Jesus an honourable burial. John says that Joseph was assisted in the burial process by Nicodemus, who brought a mixture of myrrh and aloes and included these spices in the burial cloth according to Jewish customs. By touching a dead body, both men were knowingly willing to make themselves "unclean" for seven days per the law stated in Numbers 19:11. N. T. Wright notes that the burial of Christ is part of the earliest gospel traditions. John A.T. Robinson states that the burial of Jesus in the tomb is one of the earliest and best-attested facts about Jesus." Rudolf Bultmann described the basic story as 'a historical account which creates no impression of being a legend'. John Dominic Crossan, however, suggests that Jesus' body was eaten by dogs as it hung on the cross so that there was nothing left to bury. Martin Hengel argued that Jesus was buried in disgrace as an executed criminal who died a shameful death, a view widely accepted in scholarly literature. Paul the Apostle includes the burial in his statement of the gospel in verses 3 and 4 of 1 Corinthians 15: "For I delivered unto you first of all that which I also received, how that Christ died for our sins according to the scriptures; And that he was buried, and that he rose again the third day according to the scriptures" (KJV). This appears to be an early pre-Pauline credal statement. The burial of Christ is specifically mentioned in the Apostles' Creed, where it says that Jesus was "crucified, dead, and buried." The Heidelberg Catechism asks "Why was he buried?" and gives the answer "His burial testified that He had really died." 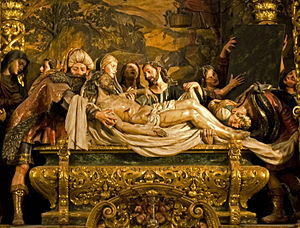 The Catechism of the Catholic Church states that, "It is the mystery of Holy Saturday, when Christ, lying in the tomb, reveals God's great sabbath rest after the fulfillment of man's salvation, which brings peace to the whole universe" and that "Christ's stay in the tomb constitutes the real link between his passible state before Easter and his glorious and risen state today." The Entombment of Christ has been a popular subject in art, being developed in Western Europe in the 10th century. It appears in cycles of the Life of Christ, where it follows the Deposition of Christ or the Lamentation of Christ. Since the Renaissance, it has sometimes been combined or conflated with one of these. John Wilbur Chapman's hymn "One Day" interprets the burial of Christ by saying "Buried, He carried my sins far away." Wikimedia Commons has media related to Entombment of Christ. ^ Watson E. Mills, Acts and Pauline Writings, Mercer University Press 1997, page 175. ^ a b Douglas R. A. Hare, Mark (Westminster John Knox Press, 1996) page 220. ^ Maurice Casey, Jesus of Nazareth: An Independent Historian's Account of His Life and Teaching (Continuum, 2010) page 449. ^ Harrington (1991), p. 8. ^ Daniel J. Harrington, The Gospel of Matthew (Liturgical Press, 1991) page 406. ^ a b Donald Senior, The Passion of Jesus in the Gospel of Matthew (Liturgical Press, 1990) page 151. ^ Donald Senior, The Passion of Jesus in the Gospel of Matthew (Liturgical Press, 1990) page 151-2. ^ Harrington (1991), p. 407. ^ Davies (2004), p. xii. ^ N. T. Wright, Luke For Everyone (Westminster John Knox Press), page 286. ^ Wright, N. T. (2009). The Challenge of Easter. p. 22. ^ Robinson, John A.T. (1973). The human face of God. Philadelphia: Westminster Press. p. 131. ISBN 978-0-664-20970-4. ^ a b Magness, Jodi (2011). Stone and Dung, Oil and Spit: Jewish Daily Life in the Time of Jesus. Eerdmans. p. 146. ^ Crossan, John Dominic (2009). Jesus: A Revolutionary Biography. p. 143. ^ Heidelberg Catechism, Q & A 41. ^ Catechism of the Catholic Church, 624-625 Archived December 25, 2010, at the Wayback Machine. This page was last edited on 2 March 2019, at 22:15 (UTC).